(Evangelical Focus) — A delegation of Spanish evangelical Christians were welcomed at the royal palace La Zarzuela on July 27. 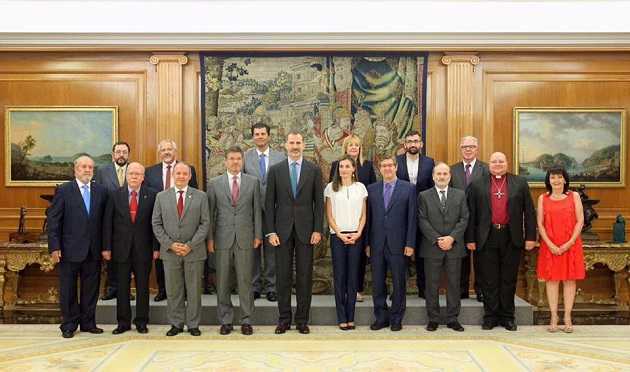 King Felipe VI, Queen Letizia and the Justice Minister Rafael Catalá met 14 Protestant leaders. This reception was organised two weeks after the celebration of the 8th Evangelical Congress, in which 1,000 representatives analysed the spiritual and social situation of Spain. In addition, hundreds of young Christians spent a week together sharing their faith in the streets of Madrid, and more than 8,000 took part in public celebrations. This is the first time this King and Queen welcome Protestants for an exclusive hearing. Evangelicals had been received in the royal palace once before: in 1997, when Juan Carlos I was king.